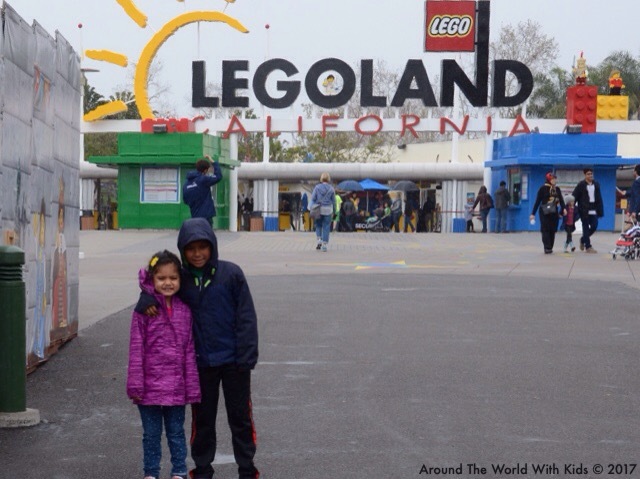 Ever since my kids figured out that DisneyLand and LegoLand exist, they have been begging to go. So when I suggested a road trip for President’s Day weekend, both immediately began the campaign once again. After accessing discount tickets from work and running some numbers, I figured out that it was possible. We would have to drive, but thanks to the 3 day weekend, we had the time to do it. So we booked a hotel, packed up the car, and headed down to Southern California. Not surprisingly, the rides were the most amazing part of the park. Legoland is really geared toward the 3 – 10 age range. After 10, the rides don’t hold as much appeal. At 4 and 7, my kids were the perfect age for the park. The park has lots of family friendly rides. 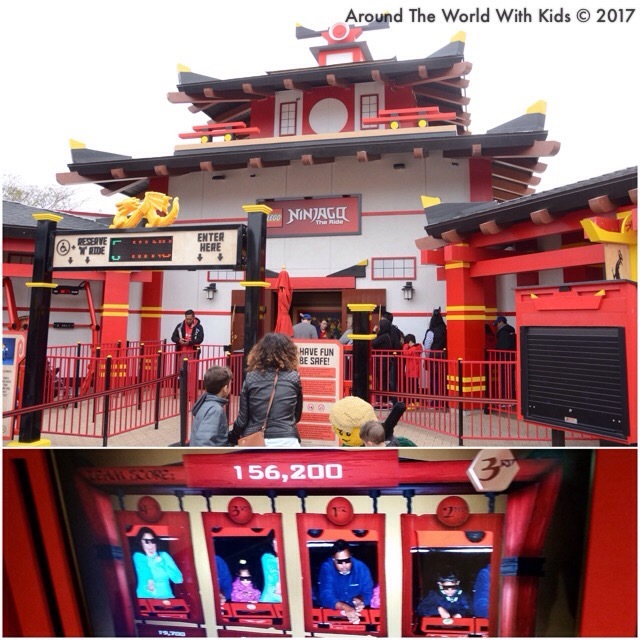 The most popular is the Ninjago ride, a car that takes you through a 3D show where you use your “elemental powers” (hands) to shoot targets and fight off bad guys. We went to the line as soon as the park opened and had to wait only 15 minutes. Throughout the day we regularly saw waits times of 45 – 90 minutes, so I highly suggest you head to that ride first. 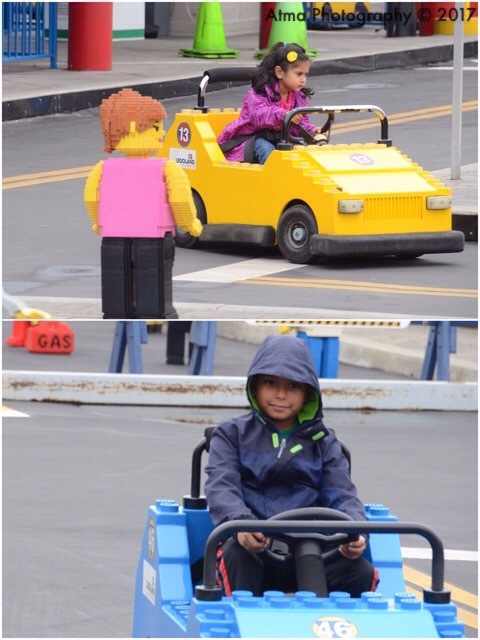 The other crowd pleaser was the Lego driving school. There are two courses, one for 3-5 year olds and one for 6-12 year olds. Both my children went in the older course and had a fantastic time driving around. The course had multiple streets and turns, and they had free reign to go wherever they want in there cars. We were lucky to do this ride when it was raining lightly, so there were no lines. They did it 3 or 4 times in a row. The other rides that the kids really loved was the Royal Joust, where they “rode” horses through a course, the Dragon (a tame roller coaster), the Lost Kingdom Adventure, where you road through an ancient pyramid and shoot at targets, and the Wave Racers, where you rode a “jet ski” and dodged water explosions. We parents loved the Coast Cruise. It’s a 10 minute boat ride throughout Legloland, where you can see some cool Lego creations up close, and the rider gives you amazing facts about how many Lego pieces it took to make that model. 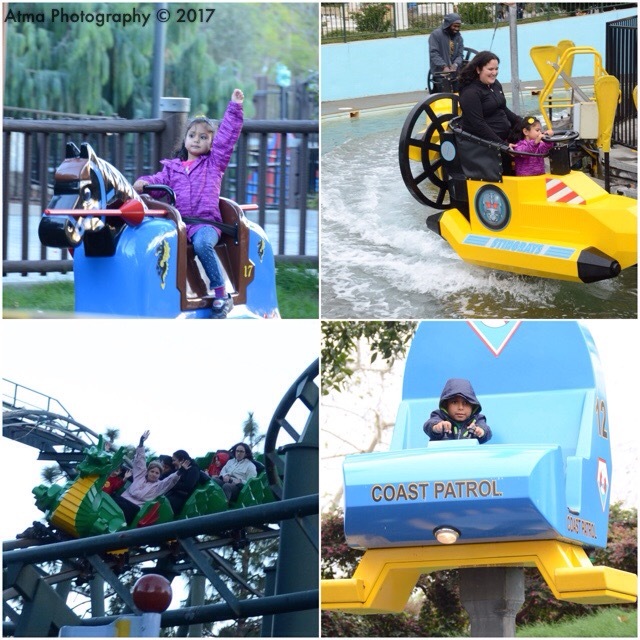 Given the age range that Legoland is geared toward, there are several play structures throughout the park. 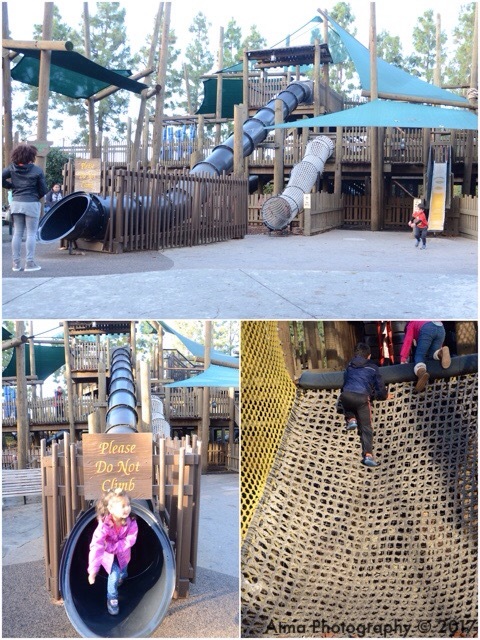 The kids loved the Hideaway in the Castle area, which had great rope ladders and secret hiding spots for kids. In addition Pharaoh’s revenge was a fan favorite since you could shoot balls up in the air and all around. (Warning, if the ball hits you in the face, it hurts). 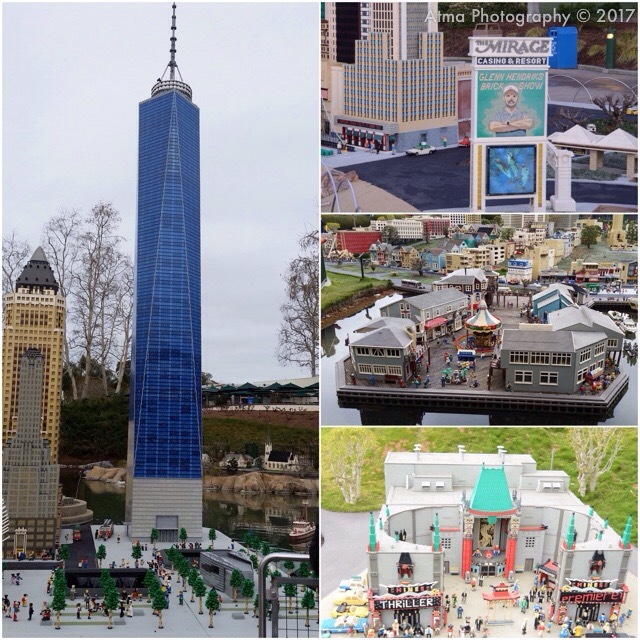 Miniland was one place I read about ahead of time and was really excited to see. 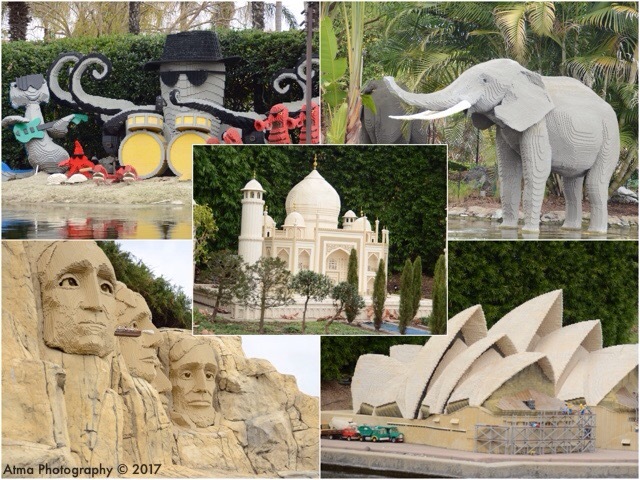 In a large area of the park, there are with detailed, large scale re-creations of Las Vegas, New Orleans, NYC, LA, San Francisco, and various other places. The detail is amazing, right down to street signs, light posts, people smooching in an alley in Vegas, everything! Miniland also had a Star Wars section that was quite extensive. There was a fair amount of fencing suggesting more Star Wars is coming soon! 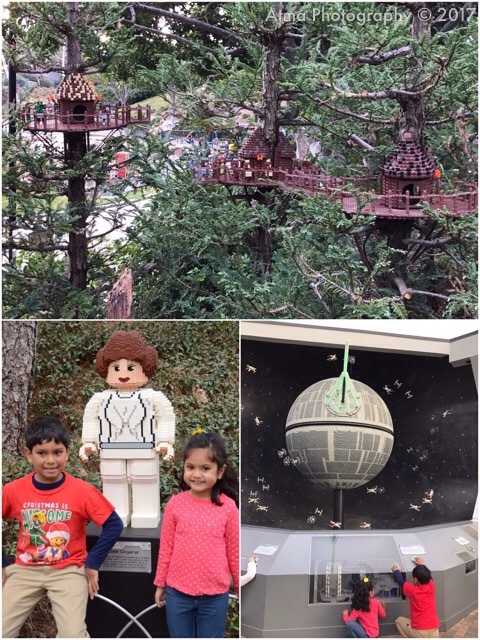 It wouldn’t be Legoland if there weren’t Legos for you to build with. Thought out the park, there were great building areas where kids could sit down, relax, and let their imagination take over. 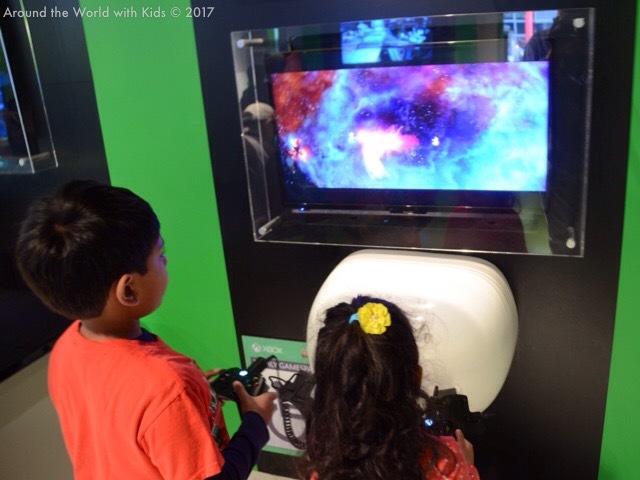 I found my kids really enjoyed their time here because it was so interactive. 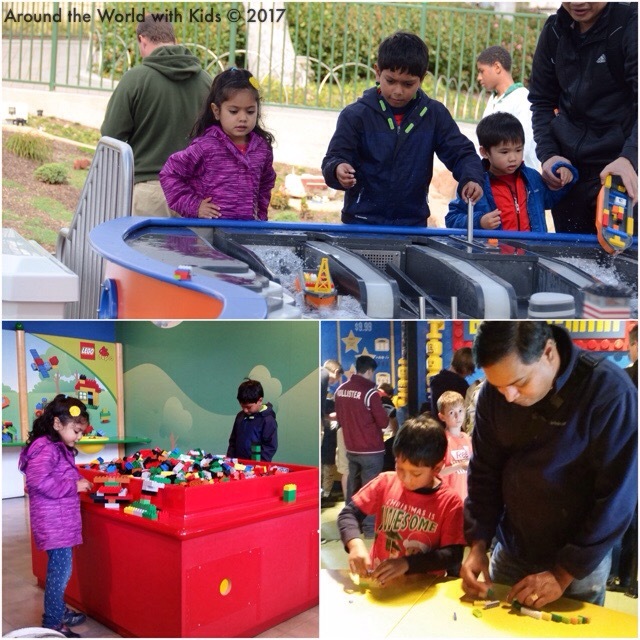 My kids played with Duplos at Duplo Play, build vehicles and houses for their mini-figures in the LegoClub and build cars to race in the Build and Test Lab. They really spent a lot of time at the Build a Boat Station, where they designed different boats and raced it down a water way. The park is large and overwhelming and sometimes you just need a break. The movie and video game room was perfect for this. On Saturday, when the rain was picking up, we went to see the 4D movie, which was a short movie featuring the Lego Movie stars. 4D is a 3D movie, with effects added such as mist raining down and fog at key points. Make sure your camera is covered! The X-Box lounge is as you’d expect, a room full of X-Boxes. The weekend we were in the park, they were all loaded with the new Lego Batman game. My husband and I battled and quickly realized we had no idea what we were doing. Our kids however quickly figured out the goal, and set about collecting as many gold coins as possible, while changing costumes on their characters constantly. This given they never played an X-Box before in their lives. Amazing. LegoLand has shows and character viewings, like most big parks, but they are not quite to the Disney standard. However, my daughter loved dancing with the LegoFriends in Heartfelt City, and both were excited to meet Emmet and Kai, two of their favorite Lego characters. 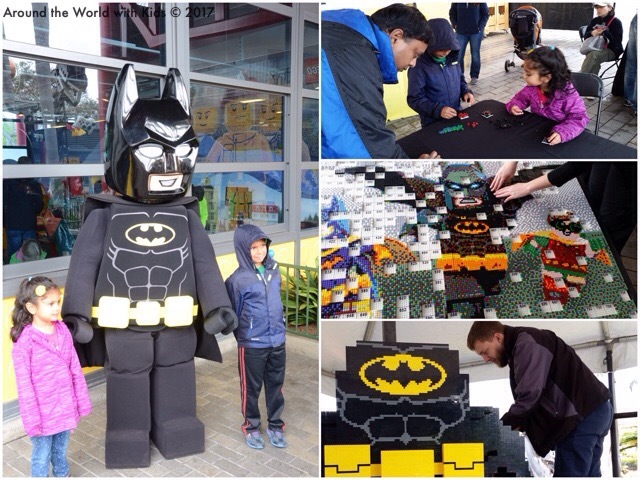 We lucked out and were in LegoLand during Lego Batman Movie Days. The park had several special events due to the movie. My kids helped build a Lego Mural of the movie’s characters, built black blocks for the Giant Lego Batman creation, and met the cape cruiser himself in the park. I think the most fun for them was the scavenger hunt. The kids were given clues, and they had to find letters hidden with Lego Batman Villain mini-figures hidden throughout Mini-land. One key tip I was given before going to LegoLand was to download the LegoLand App. That turned out to be a life saver on so many levels. As soon as we entered the park, it detected you were there and sent offers, let you know if a show was coming up, or when a character visit was around. If you were lost, it could pinpoint you on the map, and give you walking directions to whatever, show, ride, attraction, or dining option you were trying to get too. It also had wait times for all the rides. We used to a ton to strategically race to rides we wanted to go on when we saw the wait times became reasonable. You are insane if you think you are getting out of LegoLand without buying any Legos. We made the kids use their own spending money, but we took them to “The Big Shop” the biggest shop in LegoLand. It’s a Lego fanatics dream, with sets from every line they create. Plus t-shirts, key-chains, books, hats etc. I had to restrain myself ( retail therapy is my favorite type of therapy), but the kids went nuts (within their budget). 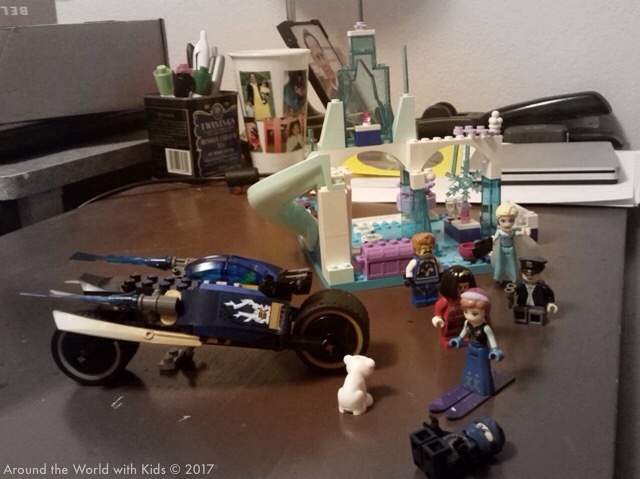 My son picked up new models from Ninjago and Star Wars lines, while my daughter got her first Lego Juniors set (Frozen of course), and a book about the Lego Movie. It was 16 hours of driving to spend 16 hours in the park, but it was worth every minute. The kids loved everything: The rides, the building, meeting characters, everything. For days afterward they were talking about their trip and how much fun they had. Lego sets have been built and they are enjoying playing endlessly with them. And we are still reading the Wyldsytle book every night. I’m so glad to get a chance to cross this bucket item off my list, and encourage everyone to take the plunge and go! 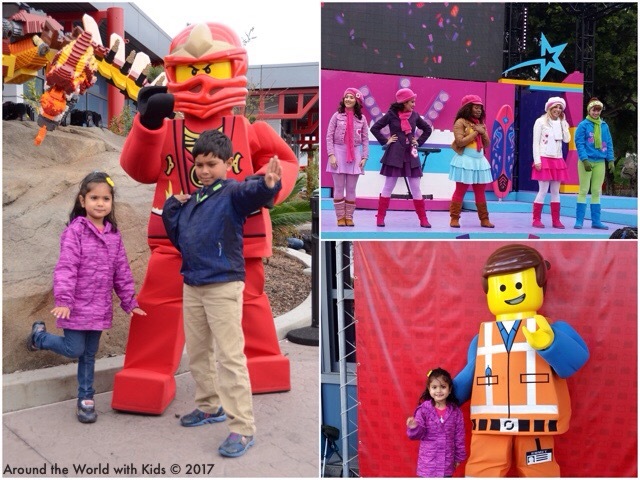 2 Day Tickets packages available with additional admission to SeaLife Aquarium and the LegoLand Water Park. Water Park closed during the winter.